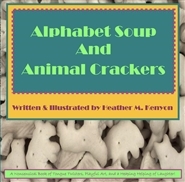 From A to Z to the rainbow of color and beyond, Alphabet Soup and Animal Crackers captures the wonder of learning using playful art and tongue tingling alliterations! With an added and unique twist, each painting included for every animal,has over 25 smaller creatures within for even more creative discovery! A great addition to any bookshelf, from teaching toddlers the basic fundamentals of reading, all the way through grade school!